I posted yesterday that I didn’t know when I’d be able to share the cover art for Red Hood’s Revenge [B&N | Mysterious Galaxy | Amazon]. The answer, apparently, was “very, very soon.” I spotted the cover at B&N, then received a cleaner copy from DAW. Click the thumbnail for a larger version. As noted before, we had to switch artists in mid-series. This was done by Mel Grant (who also did my goblin covers). The cover for Mermaid remains my favorite, but I think he did a great job making sure it was recognizable and consistent with the earlier books. 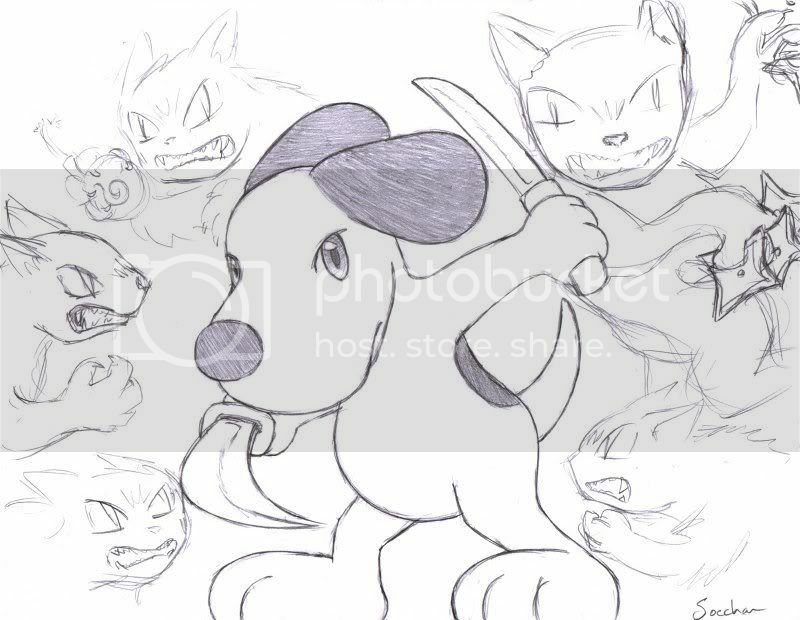 I also asked yesterday whether an anime-style Snoopy fighting cat ninjas would be awesome or terrifying. socchan took up the challenge, and the answer is: Awesome!!! The Snow Queen’s Snare was a close runner-up, but didn’t quite fit the plot as well. Shadow was suggested almost simultaneously by two users on LJ and my jimchines.com blog, so I’ve decided to name them both winners. Congrats to miladygrey and Sewicked. I’ll be e-mailing you about your prizes! 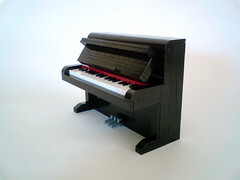 Finally, because I haven’t done one in a little while, a LEGO piano by catarino. I used to play piano, and I love the detail on this thing. Check this closeup of the keys, or just click the image below for more shots of the piano and catarino’s other work. So on Tuesday we had an all-nighter at the E.R. Last night my four-year-old got sick. This week officially bites the wax tadpole. I did have two follow-ups to yesterday’s post on e-book file sharing. 1. It’s almost a rule on the Internet: Don’t read the comments. Particularly with something like book piracy, it’s easy to get into rabid nastiness. Instead, once again people were thoughtful, respectful, and flat-out smart in your comments and conversation yesterday. Thank you for that. Y’all are awesome. When you buy a paper book, you purchase a physical object that you now own. It’s a thing, and you can do whatever you like with it — keep it, burn it, give it away, sell it, etc. With an electronic book, there’s no physical object. With file sharing, you’re not sharing a single object that you’ve purchased and now own; instead, you’re distributing that book. You basically set up a competing “publisher,” one which takes the work done by the actual publisher, then distributes the end product for free. And that’s about all my brain is good for today, so here, have some LEGO. Most of you should recall the Nebulon-B Medical Frigate from the end of Empire Strikes Back? 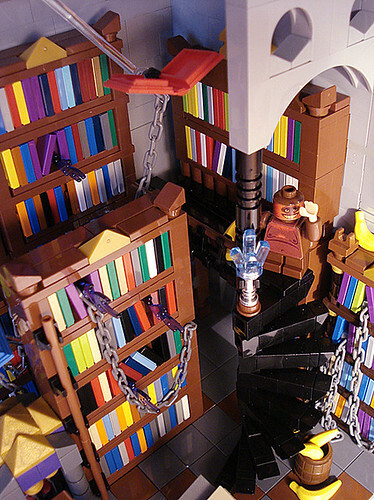 Steef de Prouw has done it in LEGO. This thing is amazing, over four feet long, with little docked X-wings and even the Millennium Falcon. Click the pic for the full photo set. 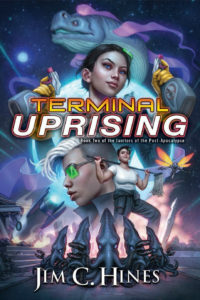 • Looking at my schedule for this weekend more closely, I’m doing the writing workshop at the same time as the DAW vs. Baen panel, so unless we have last-minute dropouts from the workshop, it looks like I’ll be missing that panel. I’m sad about this, because it had the potential to be … well, lively, if nothing else. • My annual domestic violence book drive will be starting next week. Details to come. 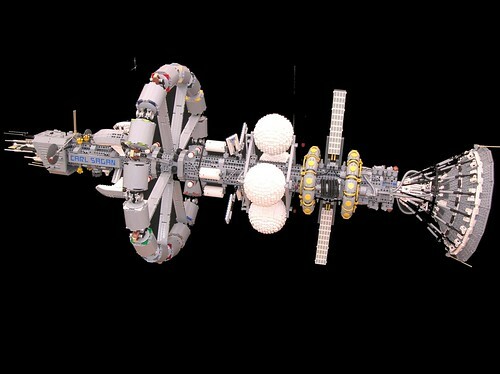 • Finally, dear NASA — please build this. 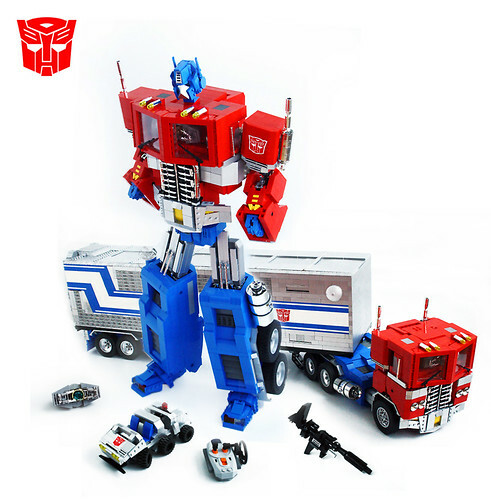 (Only, you know, out of genuine spaceworthy materials instead of LEGO.) 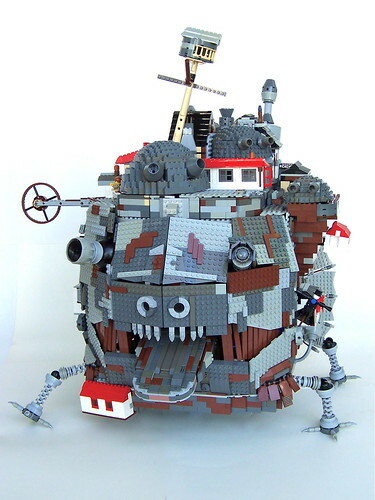 This is the Carl Sagan, a mindblowing collaborative project between Lego Monster and Mad Physicist. It even has its own shuttles! One picture does not do this sucker justice. Click the pic for the full set. 3. Finally, check out mcmorran’s LEGO Dr. Who Flickr set. 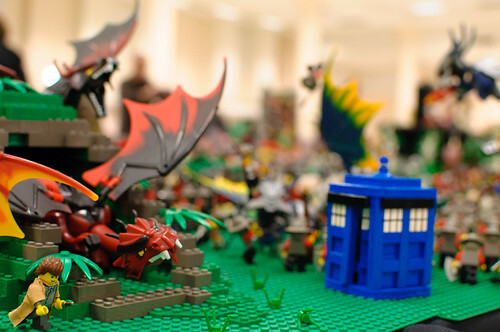 He built a LEGO Tardis and Dr. Who, and added them to various exhibits at a LEGO con. Click the link or the pic to see the full set. Not feeling so great this morning. I don’t have time to get sick, dangit! But this means you get the bullet-point blog post today. • My agent e-mailed me my latest royalties statement, and all three goblin books have earned out their advances! Can I get a Booya? To everyone who bought and shared the books, thank you so much! It looks like Stepsister will likely follow suit, but not until the Reserve Against Returns decreases a bit more. • The caption contest is still running strong, and there are some seriously entertaining entries already, mostly on the LJ post. • I donated an autographed copy of The Stepsister Scheme [Amazon | Mysterious Galaxy] to an auction to raise money for MSU Safe Place, the local Domestic Violence shelter where I used to work as the male outreach coordinator. Bidding starts at $15 here and runs through October 9. • Since I’ve gotten into the habit of wrapping up these random blog posts with LEGO, have a LEGO Star Wars chess set, courtesy of icgetaway. Click the picture below for the full photo set. • Holy crap! Some time this week, I hit the 1000 friends mark on LJ. This calls for a book giveaway! I used random.org to pick a winner: #676. I then realized that counting through the list to figure out who #676 was would be a major headache, but fortunately, plugging ’em into Excel proved to be quicker. Congratulations, patesden! Would you please e-mail me at jim -at- jimchines.com to let me know which of my books you’d like and where to sent it? • Last night was my daughter’s first day of soccer practice, so I was out entertaining the boy at the park while she practiced, which means I didn’t have time to think up anything for today’s post. 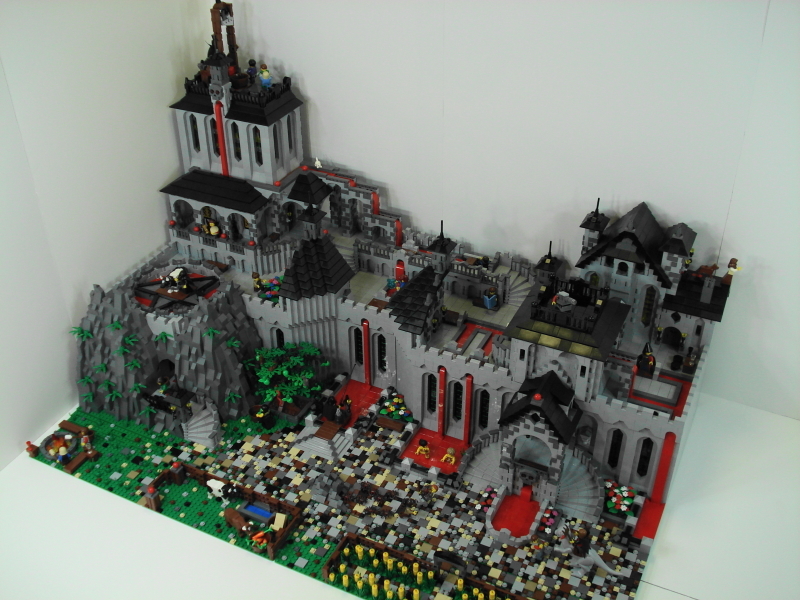 So instead, check out this LEGO Demonic Castle by einsteinonthebeach. Click the link or the picture for details. This thing is mind-blowing and seriously twisted. Minifigs bathing in LEGO blood falls? Evil genius.